What do wreaths, boot stuffers, paint brush holders, foam sabers, floating beverage boats, Halloween costumes, and a variety of teaching activities have in common? You guessed it—they can all be made using pool noodles! Cut the colorful foam rods into chunks and students can stack ’em, sort ’em, and build with ’em. Label the foam chunks with letters for a name spelling center, a phonics center, or an alphabetizing center. Or label equal-size noodle chunks for a fraction center. And don’t even get me started on different ways to use pool noodles for fine motor practice and craft projects. Teachers are the best at finding educational uses for inexpensive items. 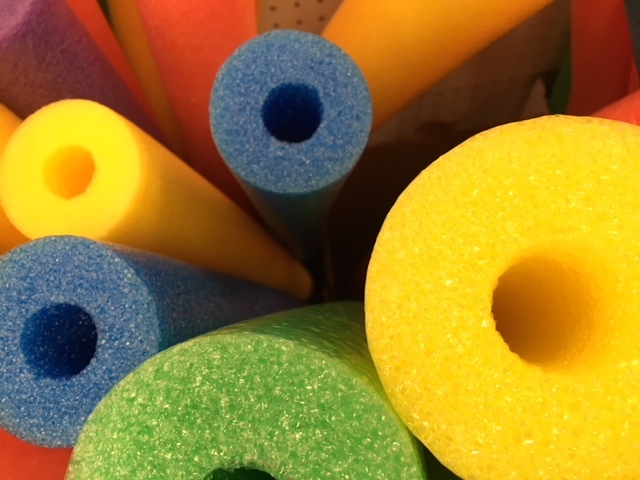 Tell us how you use pool noodles—in the classroom, around your home, or in the pool! If you’ve never before used the noodles, now’s the time to pick some up at your local dollar store. They are only a buck apiece! PS: Have you found an educational use for another inexpensive (and unsuspecting!) item? Do share! One of my Favorite things he children’s was when we used noodles as fire hoses during a Dramatic Play Activity. I was a news reporter and my children were Fire Fighters, Police, Camera men/women and civilians at the scene of of a fire at a Day Care (ours). We surprised our Director in the kitchen saying we arrived on the scene the kitchen in our costumes and the fire hose noodles. She thought it was the most dramatic play she ever saw. It became the children’s favorite themes to act out on a daily basis. Suzy, What a GREAT idea! Thanks for sharing. It’s funny that this is your topic since we’re making pirate ships this week using pieces of pool noodles and straws. Plain old yellow dish sponges make GREAT french fries when cut into “slices”. Use for pretend play, or make a really cool fry counting game with fry boxes from a local fast food place.